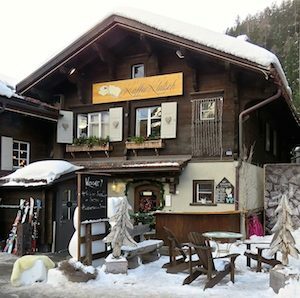 Kaffee Klatsch Lounge is conveniently situated right next to Gotschnabahn (Gotschna station), where a cable car conveys skiers up the mountain. As we settle down, snatches of different languages come floating through the air: at our table, there is a mixture of English, German, Dutch, and Afrikaans. Dominique grew up in Zurich, but family holidays were spent in Klosters. She went on to study business and commerce and then worked as a flight attendant. 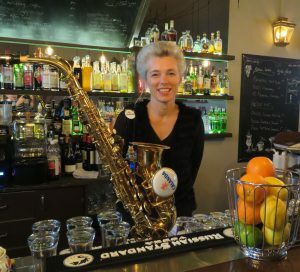 After raising two children, she settled in Davos with her partner who was running the Bardill Sports store in nearby Klosters. Kaffee Klatsch Lounge caters for diverse guests, local and foreign, young and old. In the more traditional ‘Kaffee section’ one can savor the famous hand-brewed coffees, fine choice teas, a variety of baked goods and wholesome meals made with fresh seasonal ingredients. 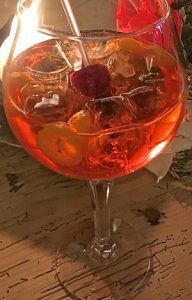 The adjoining Sports Bar has two levels, each boasting a well-stocked bar offering fine wines and fun-loving signature cocktails, and of course, the vibrant après-ski drink Aperol Spritz, an aperitif consisting of Aperol, an orange-based liquor, prosecco, a splash of soda water, ice cubes and decorative slices of citrus fruit. 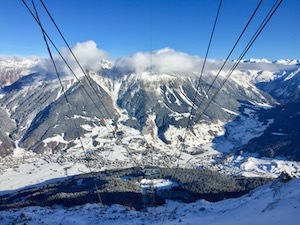 The Sun Terrace outside, overlooking the Landquart river, offers beautiful scenic views and one can watch the cable cars going up and down the snow-capped mountain. Cushions and cozy blankets are splashed around on the ample seating to ward off the cold. During the busy winter months, Kaffee Klatsch Lounge hums with activity, and a DJ offers additional entertainment in the early evening. The Sports Bar is used regularly for private functions and New Year is celebrated with fireworks and enthusiastic dance parties. This ambiance is enhanced by Dominique’s eclectic interior decorating style and personal flair. During her travels, she brings back objects that ‘touched her heart’ and finds a special place for them in Kaffee Klatsch Lounge. 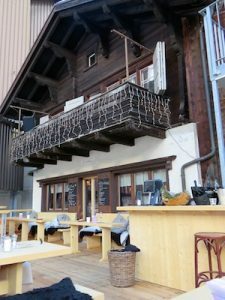 Although Klosters is renowned as the playground for royalty, it has retained its character as an unspoiled traditional village. At this moment, however, we raise another glass to camaraderie and friendship during après-ski moments in the Sports Bar. Pre-Ski, Après-Ski or without Ski – Kaffee Klatsch Lounge is the place to be.